Smith completed 20 of 32 pass attempts for 178 yards and a touchdown during Sunday's 20-13 win over the Giants. He also carried three times for 13 yards. Smith completed 14 of 25 passing attempts for 178 yards and a touchdown in Sunday's 20-17 win over the Cowboys. He ran for 16 yards on four carries. Analysis: Smith completed a season-low 56 percent of his passes Sunday while failing to reach 200 passing yards for the second straight week. The 34-year-old again struggled to find a rhythm but was bailed out by his defense. He'll try to rebound on the road Week 8 against the Giants. 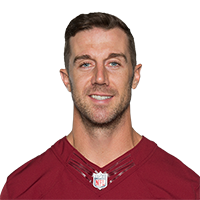 Smith completed 21 of 36 passes for 163 yards with two touchdowns and no interceptions in the Redskins' 23-17 win over the Panthers on Sunday. He also rushed six times for 13 yards and fumbled once, but it was recovered. Smith completed 23 of 39 passes for 275 yards and an interception in Monday night's 43-19 loss to the Saints. He also rushed twice for seven yards and a touchdown, but lost a fumble as well. Analysis: Smith was pretty poor for the majority of Monday's blowout defeat, which included a fourth-down interception that all but ended Washington's hopes of a comeback during the second half. On the next drive, Smith fumbled on another fourth-down attempt. 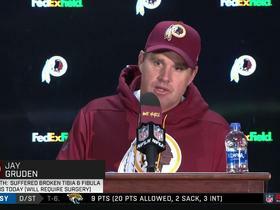 Besides his four-yard touchdown run to end the second quarter, Smith's only other bright spots came on the Redskins' last offensive series, which saw him throw for 77 yards. He'll hope to build on that Week 6 at home versus the Panthers. Smith completed 12 of 20 passes for 220 yards with two touchdowns and one interception in the Redskins' 31-17 win over the Packers on Sunday. He also rushed seven times for 20 yards. Smith completed 33 of 46 passes for 292 yards without a touchdown or turnover while adding 14 yards on four carries in Sunday's 21-9 loss to the Colts. Analysis: Washington's running game couldn't get anything going, and Smith was stuck checking the ball down. 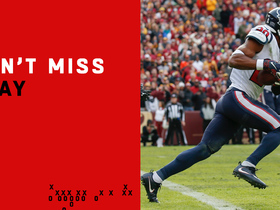 He took care of the ball as usual, but he failed to lead the offense into the end zone and managed only 6.3 yards per attempts after posting a robust 8.5 in his Redskins debut. While Andrew Luck threw for only 179 yards to Smith's 292, Indianapolis' ability to convert three times in the red zone was the difference in the game. Smith completed 21 of 30 passes for 255 yards and two touchdowns in Sunday's 24-6 road win over the Cardinals. 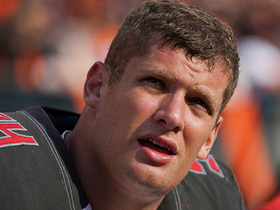 Smith completed three of eight passes for 33 yards in Friday's preseason game against Denver. Analysis: Washington used the early portion of the game to evaluate Adrian Peterson, who took 11 carries for 56 yards on the four drives Smith played. 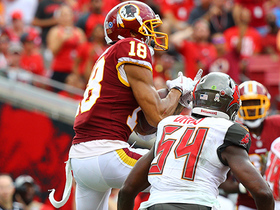 With Jordan Reed (toe), Jamison Crowder (groin) and Chris Thompson (leg) all held out, Smith directed seven of his eight passes to either Vernon Davis or Paul Richardson. We probably won't see Smith again until Week 1, at which point he should have Reed, Crowder and Thompson back at his disposal for a road game in Arizona. 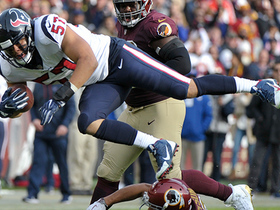 Smith is likely to get extended playing time in Friday's preseason game against Denver, Rick Snider of The Washington Post reports. Smith completed four of six passes for 48 yards in Thursday's preseason game against the Jets. 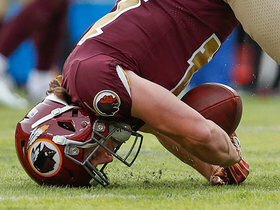 Analysis: Smith played one series in his Redskins debut, completing passes to four different players to set up a chip-shot field goal at the end of a 71-yard drive. He didn't have Jamison Crowder (groin) or Jordan Reed (toe) at his disposal, but both players seem to be on track for Week 1 in Arizona. Smith officially has been traded from the Chiefs to the Redskins for cornerback Kendall Fuller and a third-round pick in the 2018 draft. 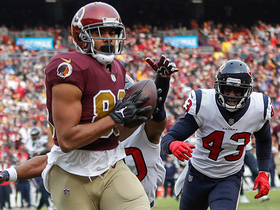 Updating a previous note, Smith will be traded from Kansas City to Washington in exchange for Kendall Fuller and a third-round draft pick, Adam Schefter of ESPN.com reports. 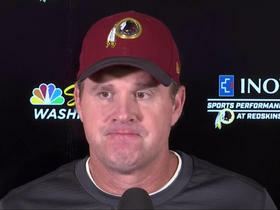 Smith will sign a four-year contract extension with the Redskins, Adam Schefter of ESPN.com reports. Analysis: Smith was heading into the final year of his contract with Kansas City but will now be under contract with Washington until 2022. At the earliest, the extension will be signed at the beginning of the new league year, March 14, which is when the trade will officially go through. The specifics of the extension remain unknown but look for those details to emerge over the next couple of weeks. An agreement is in place between Kansas City and Washington to trade Smith to the Redskins, Terez Paylor of The Kansas City Star reports. Analysis: Information on the trade remains largely unknown, as the deal cannot take place until the new league year officially starts on March 14. Smith is coming off one of the best seasons of his career, setting career-highs in passing yards (4,042) and touchdowns (26). With Smith heading to Washington, Kirk Cousins will now need to find a new home after receiving the franchise tag each of the past two seasons. Smith completed 24 of 33 passes for 264 yards and two touchdowns while adding 13 yards on four carries without a turnover in Saturday's 22-21, wild-card round loss to the Titans. Smith is officially active but not expected to play in Sunday's season finale against the Broncos. Analysis: Smith's status means he'll be in uniform and available to step in should rookie Patrick Mahomes suffer an injury, but that projects to be the only scenario under which he'd see the field before the postseason. Patrick Mahomes will start at quarterback in place of Smith in Sunday's regular-season finale against the Broncos, Terez A. Paylor of the Kansas City Star reports. Smith completed 25 of 39 passes for 304 yards with one touchdown and no interceptions in Sunday's 29-13 win over the Dolphins. He also gained 13 yards on four rushes. Smith completed 23 of 30 passes for 231 yards and two touchdowns in Saturday's 30-13 win over the Chargers. He also gained 13 yards on three carries. Smith completed 20 of 34 passes for 268 yards and an interception while rushing five times for 24 yards in Sunday's 26-15 win over Oakland. Smith completed 19 of 33 passes for 366 yards and four touchdowns while adding a 70-yard run in Sunday's 38-31 loss to the Jets. 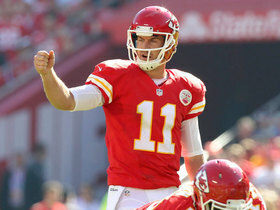 The Chiefs plan to stick with Smith as their starting quarterback for the final five games of the season, Ian Rapoport of NFL Network reports. "My understanding is that it is not off the table that we will see [backup quarterback] Patrick Mahomes later this season at some point," Rapoport said Sunday on the NFL Network's "NFL GameDay Morning" program. "However, the Chiefs' plan as it stands right now is to have Patrick Mahomes take a redshirt season. 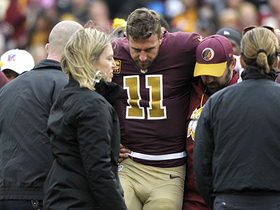 They plan to have Alex Smith [be] their quarterback for the rest of the year." They believe it's more physical mistakes than anything and they hope and think that the offense will respond. Chiefs head coach Andy Reid reiterated Monday that Smith would remain the team's starting quarterback Week 13 against the Jets, Terez A. Paylor of The Kansas City Star reports. "Alex is my guy," Reid said. Chiefs coach Andy Reid said he never considered removing Smith during Sunday's 16-10 loss to the Bills and won't make a change at quarterback for Week 13 against the Jets, ESPN.com's Adam Teicher reports. Smith completed 23 of 36 passes for 199 yards, one touchdown and one interception while rushing five times for 35 yards in Sunday's 16-10 loss to the Bills. Smith completed 27 of 40 passes for 230 yards whie throwing two interceptions without a touchdown, and added 27 yards on five carries in Sunday's 12-9 overtime loss to the Giants. Smith completed 25 of 34 pass attempts for 263 yards, two touchdowns and one interception Sunday against the Cowboys. He also carried five times for 19 yards in the 28-17 loss.